CU-Boulder Professor Webster Cash said the instrument package would consist of an orbiting space telescope and an opaque disk in front of it that could be up to a half mile across. According to Cash, diffracted light waves from a target star or other space object would bend around the edges of the disk and converge in a central point. That light would then be fed into the orbiting telescope to provide high-resolution images, he said. The new telescope concept, named the Aragoscope after French scientist Francois Arago who first detected diffracted light waves around a disk, could allow scientists to image space objects like black hole "event horizons" and plasma swaps between stars, said Cash of CU-Boulder's Center for Astrophysics and Space Astronomy. The novel telescope system also could point toward Earth and image objects as small as a rabbit, giving it the ability to hunt for lost campers in the mountains, he said. The CU-Boulder Aragoscope was one of 12 proposals selected for Phase One funding in June 2014 by the NASA Innovative Advanced Concept (NIAC) program, designed to turn science fiction into reality through pioneering technology development. Other Phase One NIAC proposals funded—each for $100,000 over nine months—include an orbiting device to capture tumbling asteroids and a robotic submarine to explore methane lakes on Titan, the largest moon of Saturn. In April, NIAC will select six of the 2014 Phase One concepts for Phase Two funding, which is a two-year, $500,000 award. In 2004 and 2005, Cash was awarded Phase One and Phase Two funding for a concept of a telescope and a giant, daisy-shaped "starshade" that would block light from a parent star and let light from its planets to leak around the edges, allowing the team to image them. In 2008 NASA awarded Cash and his team an additional $1 million to further the New Worlds starshade study. "Quite frankly, our New Worlds starshade project overlaps with the architecture we want to use for the Aragoscope, so we feel we are in pretty good shape going into Phase Two," said Cash. The Aragoscope would be parked in a geostationary orbit 25,000 miles high that follows Earth's rotation, making it appear motionless from the ground. "Traditionally, space telescopes have essentially been monolithic pieces of glass like the Hubble Space Telescope," said CU-Boulder doctoral student Anthony Harness of the Department of Astrophysical and Planetary Sciences, who is working with Cash on the project. "But the heavier the space telescope, the more expensive the cost of the launch. We have found a way to solve that problem by putting large, lightweight optics into space that offer a much higher resolution and lower cost." The opaque space disk would be made of a strong, dark, plastic-like material (think Hefty Bag) that could be launched in a compressed fashion like a parachute, then unfurled in orbit. The space shield would be tethered to the telescope at distances from tens to hundreds of miles depending on the size of the disk, said Harness. "The opaque disk of the Aragoscope works in a similar way to a basic lens," said Harness. "The light diffracted around the edge of the circular disk travels the same path length to the center and comes into focus as an image." Since image resolution increases with telescope diameter, being able to launch such a large, yet lightweight disk would allow astronomers to achieve higher-resolution images than with smaller, traditional space telescopes, he said. Cash and Harness said they hope to conduct an astronomical demonstration of the Aragoscope concept in the lab using a 1-meter disk placed several meters from a telescope. The light source would be fixed about 5 or 10 meters behind the disk. In addition, they hope to test the starshade concept by fixing a space disk on a mountaintop and attaching a telescope on a hovering aircraft in order to image Alpha Centauri, a binary star system that appears as the third brightest star in the sky. NIAC was created in 1998 to solicit revolutionary concepts from people and organizations that could advance NASA's missions. The winning concepts "push the limits of science and technology" and are expected to take at least a decade to develop. In addition to the Aragoscope and Starshade project, cash won Phase One and Phase Two funding for a third NIAC concept in 2000 and 2001 when he proposed an X-ray interferometer that could be used to look down the mouths of black holes. A static 1m demo is a lot different from a 1000m, tethered, and solar wind driven, disc when you have to maintain dimensions and focal length stability to a sub wavelength of light. We both know that we can't do it, but cut the professionals some slack. If light only goes through the edge of the disk, doesn't that mean that the total surface era is pretty small, thus collecting few photons? Will one small hole in the plastic render it useless? 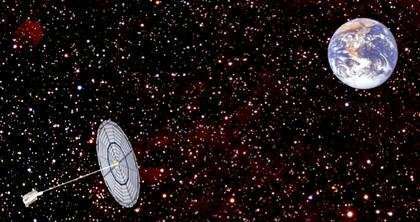 if the Disk is 100 miles away, how can it be moved to allow the telescope to point at earth?. Sounds to me like it would just act as a very big solar sail, so how much fuel would then be required to compensate for solar effects and keep the telescope in geostationary orbit ?. And, if it is Geo-Stationary then how could it possibly be used to search for lost campers etc. This is full of ridiculous concepts which seem more aimed at getting grant money than actually producing something practical. Surely it would be cheaper and more practical to manufacture a refracting telescope on the moon using locally available resources. "This is full of ridiculous concepts which seem more aimed at getting grant money than actually producing something practical." You have revealed more about your own field than this project. Is this the way you folk operate, with scams? Just because we are unaware of how to do it does not mean others are just as ignorant. Really? So you just happen to know that building, equipping, and supporting a lunar base, plus installing the optical fabrication capacity there to build a giant refracting telescope would be cheaper than the few launches required to put this thing into space--wow! I'm amazed you had those numbers at hand. And perhaps you'll share how you plan to mount and aim your giant refractor, or will you be needing some grant money to figure that out? Doesn't this example of production of an image by light bending around a disk throw a little bit of doubt on the "light bending around distant lensing galaxies due to gravity/dark matter" theories? Good question, but no. To be sure, the astronomers check for this. For refraction, different frequencies of light will bend at different angles of refraction—e.g., a prism produces a rainbow of colors from white light. This is referred to as 'chromatic'. Gravitational lensing, on the other hand, is 'achromatic'. So astronomers can tell the difference between light that has been bent by a gravitational lens, and light that has been refracted by a molecular cloud (for example). Fogg, as your pseudonym is derived from a sci-fi character of the nineteenth century, so seem to be your comprehension of optics. Although I am honestly kind of condescending in front of your ignorance, it should not be so toward nineteenth century science because this phenomenon was discovered very early in this same century. Nope. I don't think this plan is ready for prime time. The primary problem is oscillation dampening. We don't have a method of dampening oscillations in very long cable runs in space. The secondary problem is aiming. With a 'scope a very long distance from an occluding disc, the fuel costs of reorienting the thing every time you want to aim somewhere else will be amazingly prohibitive. This sucker will never fly without technologies far beyond what we now have. Would a balloon telescope work? Same half a mile size dark plastic concept for lower half and transparent upper half. One of many challenges would be stabilizing it, may be by using Earth's magnetic field when launching it from the pole (where's Santa), or even hooking it up to ISS via cable.